For the best viewing experience, please use Google Chrome, FireFox, or Internet Explorer 8 or higher. 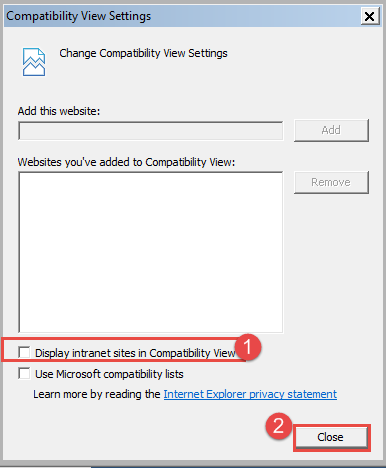 When viewing in Internet Explorer, please make sure that the browser is not set to view with compatibility settings. 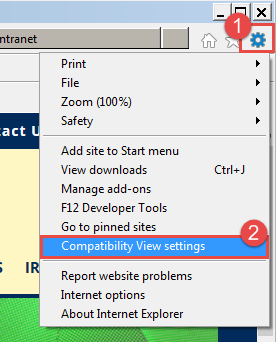 You can un-check this box in the compatibility view settings under tools. Select the settings option in the browser (1) and choose Compatibility View Settings (2) from the menu. Make sure the box is not checked (1) and select the Close button (2) when you are done. If you are still experiencing issues, please feel free to contact us for assistance.